Flu Treatments During Pregnancy: What Medications Are Safe, And Which Drugs Should You Avoid? The flu poses a special risk during pregnancy — but so do some medications. What (over the counter) drugs can you safely take, and which treatments should you stay away from when you are expecting? Influenza is, for most healthy young people, really annoying and energy-draining — but not a serious danger. Pregnancy weakens your immune system and the way your body works, however, and pregnant women are far more likely to need to be hospitalized when they catch a flu. In addition, the fever often associated with influenza has been linked to birth defects. Knowing how to treat the flu is — in short — more important during pregnancy than it ever was before you were expecting. What flu treatments are safe, and which drugs should you stay away from when you are "cooking" a baby? Painkillers and fever reducers during pregnancy: Which ones are safe? The answer is more complicated than you'd like — there is no conclusive evidence that any over-the-counter or prescription analgesic and fever reducer is safe during pregnancy, but we do know that having a fever may increase the risk that your baby is born with certain birth defects. It is, therefore, important to bring any fever you have during pregnancy down. Acetominophen (Tylenol, paracetamol) is considered the painkiller and fever reducer of choice during pregnancy. About 65 percent of expectant mothers use it at some point of their pregnancies, and studies have not indicated that this increases the risk of birth defects, though the drug does cross the placenta. Aspirin should be avoided during pregnancy unless your doctor prescribes it for a specific reason, as it comes with a small increase in the risk of gastroschisis, a birth defect in which a baby is born with their intestines on the outside of their body, and it may also lead to growth problems and hemhorrage when taken in the third trimester. NSAIDs, such as ibuprofen, should also generally be avoided during pregnancy — naproxen has been linked to orofacial clefts, while all non-steroidal anti-inflammatories may pose a risk to a developing baby's heart health. 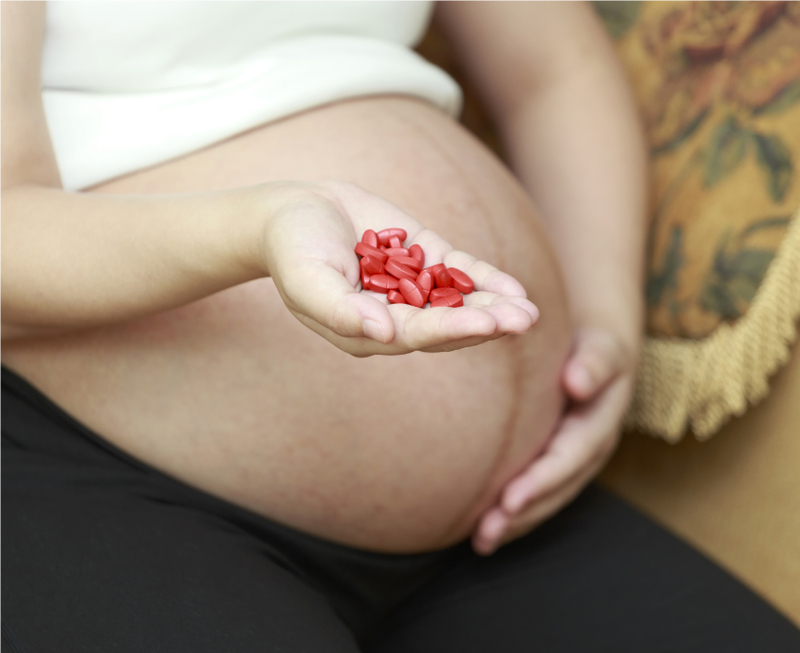 During the third trimester, NSAIDs may also lead to a reduction in the amount of amniotic fluid you have. Since the flu will have you coughing, sneezing, and leave you with a runny and congested nose, you may also be tempted to take something for these nasty symptoms if you are suffering from influenza during pregnancy. It's not currently clear whether nasal decongestants, which often contain pseudoephedrine, are safe during pregnancy, with some studies indicating that they may increase the risk of preterm labor and a low birth weight. Saline nasal sprays should be safe to use whole you're expecting, though. Expectorants, which may you cough more to get rid of mucus, tend to contain guaifenesin, which may be best avoided during pregnancy as some studies link it to neural tube defects. Dextromethorphan is often found in antiussives, medications that are meant to prevent coughs, and because it's not currently clear whether this is safe while pregnant, it may be best to avoid this, too. As a pregnant women, you'll be a member of those so-called vulnerable groups people often talk about in relation to the flu — not only might you have a higher risk of catching the flu, you're also more likely to require hospitalization. Washing your hands often, staying away from sick people, and not touching your face does go a long way toward preventing influenza and other contagious diseases, but the flu shot is still your first line of defense. All available data indicates that it's perfectly safe to get a flu shot during pregnancy — that is, the fu vaccine isn't associated with any birth defects or other adverse effects during pregnancy, while the flu itself very much is. This is why the CDC strongly advises any pregnant woman to get a flu shot. The nasal spray vaccine isn't suitable for pregnant women, meanwhile. You can get your flu shot at any point during pregnancy, ideally just at the start of the flu season. While getting a flu shot doesn't guarantee that you won't catch a flu anyway, the symptoms are usually milder and shorter in people who have had the vaccine. Antiviral medications to treat the flu: Can you have them during pregnancy? Oral oseltamivir is the antiviral of choice for pregnant women with the flu. Like other antiviral medications that treat influenza, it's at its most effective when you receive it within the first 48 hours of the initial appearance of your symptoms — and because you can get this drug from your doctor, it's important to seek medical attention as soon as you suspect the flu. Pregnant women will ideally get a flu shot to minimize their risk of coming down with influenza in the first place. Should you suspect you have a flu — whether or not you receive a vaccine — see your doctor as soon as possible to ask about antiviral medications. Do bring a fever down with Tylenol, as fevers have been shown to pose a possible risk of birth defects, but don't take any other over the counter medications unless your doctor specifically recommends them. Is Your Stomach Safe From Ulcerative Colitis?